All my life I’ve zigged where others zag. This is especially true in the garden, where I grow bored of carrots and beets and other normal things. Long-time readers of this site know this, and over the years I’ve occasionally written about the weird things I grow in my little garden. One of this year’s experiments was Stachys affinis, also known by the unappetizing name crosne — pronounced like the old woman — or the better-but-too-exotic Chinese artichoke. More obscure but far cooler is the name artichoke betony. I know, I know. They look like grubs. Or tiny Michelin men. Or splorks of vanilla ice cream. Or worse. But c’mon, they still look super cool, right? Who wouldn’t want to surprise someone with a plate full of these? As soon as I saw them, I was hooked. I planted them a year ago, and for the life of me I can’t remember where I bought the tubers. You do want to plant them as soon as the ground warms, while the tubers are still dormant. Stuck them about 2 to 3 inches into rich soil in a place that gets good sunlight, but a little afternoon shade in hot climates (like mine). I planted them where some American groundnut vines would shade them; more on that crazy plant later. 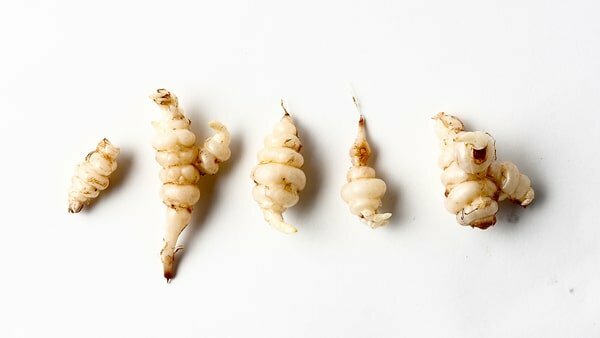 Warning 1: Crosnes take a long time to develop tubers, like all year. I did not harvest mine until November, about seven months after I planted them. Warning 2: If you want good tubers, you need to clip the plant, which looks like mint, to about 6 inches all year. Never let it flower. Warning 3: You will never get all the tubers out of your garden, so be prepared for a long-term visitor. Why bother with them? Because they’re cool little curiosities. Cleaning them requires little more than a strong jet of cool water, and they are just as tasty raw or cooked. They are very close in flavor to water chestnuts, which is to say mild, crunchy and juicy. Nutritionwise, they are low in everything — carbs, protein, sodium, fat — so you won’t be using them to survive long winters. Like I said, they are a neat accent that is easy to grow. One of the best accounts of this odd veggie is in a book called Roots: The Definitive Compendium, written by a friend of mine named Diana Morgan. This book is a vast compendium of lore, information and recipes using tubers and roots as mundane as carrots and a bizarre as skirret and konjac. The one piece of information Morgan missed, however, was the keeping time for crosnes: Every source I see says they will only keep a week in the fridge. Uh, wha? I harvested mine a month ago and they are all just fine, wrapped in a paper towel in a closed container. Hard to see where the week stricture came in. Morgan’s best piece of info on crosnes is her parboiling trick. Basically she blanches the raw tubers in salty, boiling water for 2 minutes. They’re then shocked in an ice-water bath. This step cooks them just enough for stir-fries, pickles, quick sautes or salads. 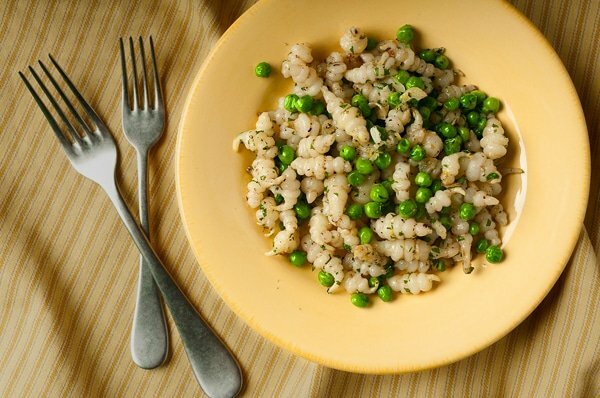 You don’t want to cook crosnes for a long time because they will get mushy and boring. Mashed crosnes is no taste treat. 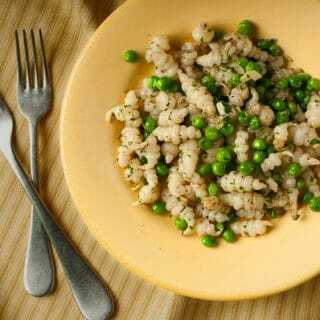 Sauteed with peas, garlic, parsley and lemon, however, they make a fun side dish or a vegetarian meal. If you are looking for other inspirations, look to the French and Chinese: They are the largest consumers of this little tuber. Your hardest task will be to find crosnes. Large farmers markets will have them in fall and winter, as will specialty markets. Probably easier would be to buy crosnes online. If anyone can located a reliable source for the tubers (for growing), please let me know in the comments section. I like a little drizzle of Oregon White Truffle Oil on this dish, but you could use another truffle oil or just leave it out. 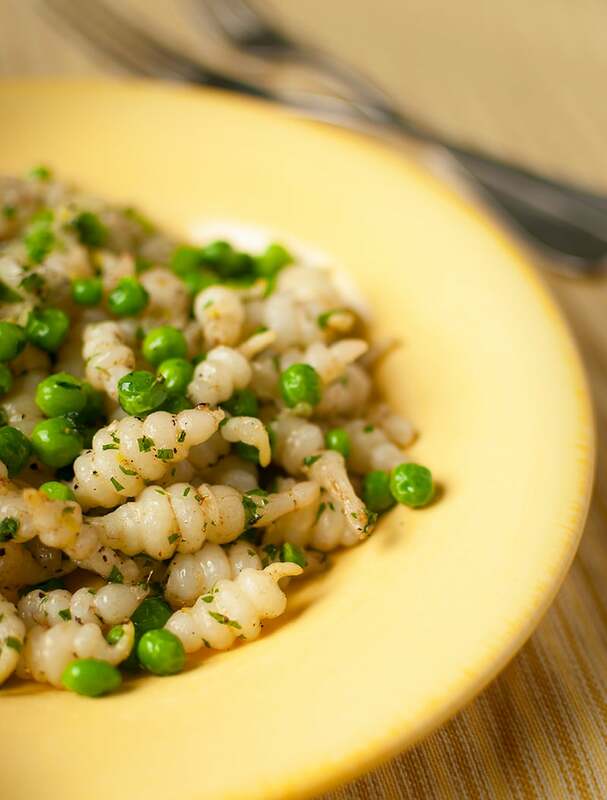 I like it because it gives the dish an earthy, luxurious base note underneath the crunch of the crosnes and the brightness of the lemon and parsley. Bring a large pot of salty water to a boil and get a bowl of ice water handy. 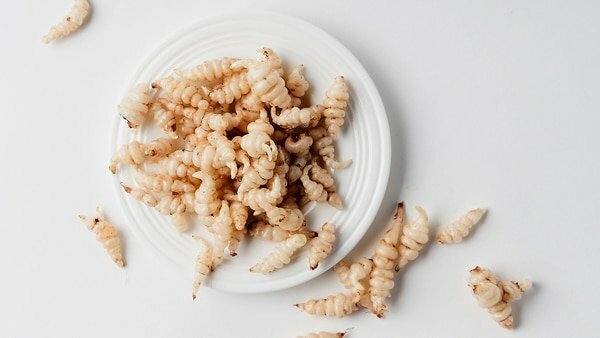 Boil the crosnes for 2 minutes, then move them to the ice water. Remove when cool and set aside. Heat the duck fat in a large saute pan over medium-high heat. When it's hot, add the crosnes and the garlic cloves and toss to coat in the fat. Sprinkle a little salt over everything and stir-fry for 1 to 2 minutes. Do not let the garlic burn. Add the peas, toss to coat and cook 1 more minute. Turn off the heat and toss in the parsley. Let this wilt for a minute or so, then drizzle over the lemon juice. Grind some black pepper over everything, garnish with the truffle oil and serve. You can also serve this as a cold side dish, but if you do, use olive oil instead of duck fat don't add the lemon juice until you are ready to serve. I found them today at Santa Monica farmers’ market. I’m trying the recipe now! Anyone know where I can purchase these in North Carolina? Try Frog Song Organics. They are down the road from us in north central Florida. I live in a town beside Savannah GA, and my yard is full of these things, I started a flower bed against my house, and I didn’t get an inch deep and was up to my elbows with them.